My fondness for chocolate often allures me to use it in manifold recipes.Nutella Chocolate Cake with rubied pomegranates and cranberry filling is my best snappy chocolate cake recipe with the flavors of the season.Its also low in sugar and needs no butter to make it better. To make the cranberry filling,reduce the cranberries with water until tender about 15 minutes;process to a smooth paste for the filling. Preheat Oven to 350F and grease a loaf pan with butter. Sift all the dry ingredients(flour and powders) in large mixing bowl. In another mixing bowl whisk together oil and sugar until creamy. Crack the egg and whisk some more and stir in vanilla. Now combine wet and dry mixtures. Pour in the baking pan and set in the oven for about 30 minutes until toothpick inserted comes out clean. Let cool for at least 2 hours on a rack. using a table knife loose the edges of the cake and flip in a plate. Halve it ,trim sides(if desired) to give a snazzy hexagonal shape ,slather one halve with cranberry filling and top with the other half .Garnish with little more cranberry filling in the center and sprinkle the pomegranate to give a jeweled rubied bedazzled look to the cake. This is my entry for Ultimate Chocolate Cake Challenge,hosted by Not Quite Nigella. This cake is also in Cooking Club Challenge hosted by Cheri of Fabulous foods. I'm also sending this Original recipe to lore's Culinarty Original Recipes. The ruby studded Nutella chocolate cake is the winner! Thanks to Lorraine for the contest and the viewers who voted for the cake. All of ur nuts recipies drive me nuts. Good job! Also check out my blog and gv ur comments and suggestions! Oh, WOW! That looks and sounds mouthwatering! I wish I had picked up some pomegranates at the store now! Wish I could have a piece! Yasmeen,from where you are coming with such yummy and awesome recipes ? I loved this one too.You are just sweet as your food..keep the good work on..
wooww.. looks great.i love nutella. cake looks very soft. I love nutella.Lovely cake.I too posted choc pudding cake,but I am not sending it,this is lovely. What is up with you and poms? You seem to have struck a harmonious cord! Look lovely. wow today third brwony cake I m seeing.Love yr cake with poms look awesome dear..
"Wer there is a nut there is Yasmeen"
Wow i would love to have a piece . It looks so beautiful and delicous. I love, love, love Nutella and am always looking for new ways to use it. I will have to try this as you combined it with another favorite food pomegranates. Thank you for the delicious looking recipe. Lovely cake Yasmeen...with nutella no need to say how i would love to have them rite now..scrumptious cake..
what luscious cake!I just love the way you use the colors and fruits in your recipes. Wow this is yet another beautiful piece.Love nutella. That is one fantastic cake you made. I love those lovely pomegranate seeds on top. 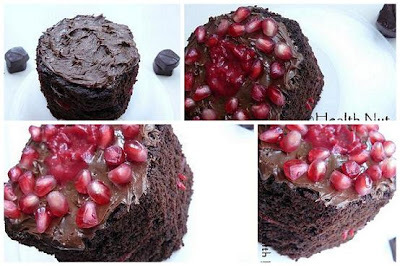 Chocolate cake couldn't get any better than this!..as you perfectly put it..with those rubied pomegranates:)..wish I could dare to bake this..I am scaredy cat when it comes to baking:((.. These little pomegranate jewels would be my "jewelry" of choice!!!!! I really like how this sounds. I have a thing for nutella and chocolate together (or not).